Perched atop a steep ridge, at the end of a modest Pisgah Forest neighborhood near Brevard, Annie Martin’s front yard shimmers; a tightly woven blanket of green clings to every knoll and rock. So bright and thick is the terrain that even the Blue Ridge chain, which spans the horizon just beyond Martin’s home, seems pale in comparison. The land is exotic and enchanting — much like Martin herself. She wears bright purple from head to toe, kaleidoscopic boots on her feet, and a large purple amulet around her neck. She calls herself Mossin’ Annie, and she has spent the past five years demystifying the more mysterious qualities of moss (like how it grows where almost nothing else will) and bringing its unique uses and beauty into the gardens of most everyone she meets. Through her business, Mountain Moss Enterprises, Martin has created moss lawns and landscapes in some expected spots: a public garden in downtown Brevard, at a sustainability center on a college campus in Upstate South Carolina, and in the yards of private homeowners. But she’s also installed them inside an exclusive, Cashiers-area golf club and on the sunny roof of a building at the North Carolina Arboretum. With every installation, she’s educated folks. Moss can live and thrive in the poorest of soils. It has no roots; it is an exceptional plant for preventing erosion. And what might appear to be a singular plant is actually a colony of many plants, all of which are seedless. Martin is creative by nature (formerly working in graphic design, photography, and media production) and is now a gardener by trade, but being a teacher has become vital to expanding her moss business, founded in 2008. She often finds herself dispelling moss myths. (Like that you can mix it up in a blender and spray it on a wall to get it to grow. Not true.) She focuses her efforts on moss conservation and education, particularly in the western part of the state, where moss is abundant but development threatens to destroy it. “I love these mountains, and I love these mosses,” Martin says. That is why she rescues it. If she sees a bulldozer coming, she steps forward and asks for permission to save what’s about to be dug up. “I can’t stop the process of logging, but I can get in there first,” she says. Martin seeks out those places where moss is about to be discarded like cleared brush, and then she reclaims it — often stacking hunks of it side by side in long, plastic toboggans, dragging the sled from one spot to the next until it is full. She studies what she’s collecting with a small jeweler’s magnifying glass that she wears around her neck. Then she loosens the plants from the soil. Once they are lifted from the earth, some of the mosses will live in shallow trays where they need little attention, just frequent watering in brief, one- or two-minute-long bursts. “This is good for my spirit, to rescue these little mosses and to know they’re going to give pleasure to people somewhere else,” Martin says. With the help of a grant through the state tobacco trust fund, she spent a year researching live mosses and how they could be used for environmental purposes and sustainable landscapes. She wanted to give tobacco farmers who had lost their seasonal income an alternative for their acreage: moss nurseries. The idea has not been embraced, but her research at least planted the seed, so to speak. In the meantime, Martin has been commissioned to do other public projects, including installing the green roof at the North Carolina Arboretum in Asheville. The arboretum’s roof, possibly the only moss roof in the country, dispels the myth that mosses only grow in shade. “We modified a tin roof by installing a misting irrigation, harvesting the rainwater, and recycling it back around,” Martin says. Section by section, she filled the roof with various mosses, and nearly a year after its installation (in 98-degree temperatures, no less) the roof has withstood hail, wind, ice, and scorching heat. Back at Martin’s home, hollowed-out logs masquerading as contemporary yard art speckle the front yard. 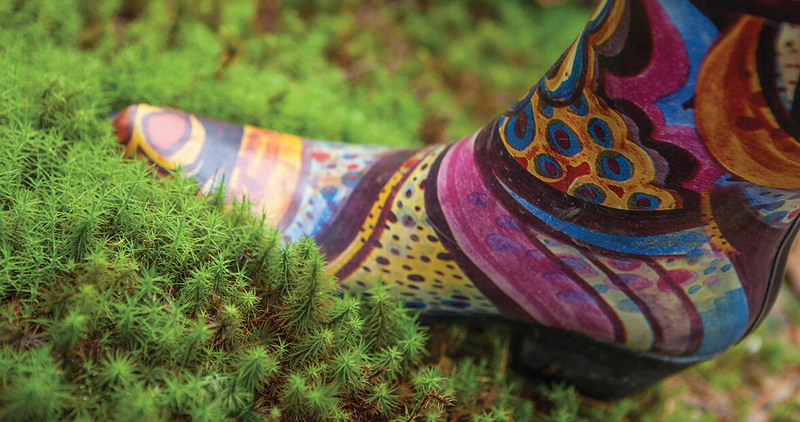 Swaths of multi-colored moss are interspersed with nebulous ponds of shimmering colored glass. As Martin strolls her yard, she points to a lush variety and calls it by name, Aulacomnium. Touchable and exotic, it looks like an above-ground coral reef and feels like a wet featherbed to the touch. “Step on it. Roll in it!” she says. The plants are hardy, and bounce back quickly with a spray of water and a fluff of the hand. It’s just part of what makes them so easy to care for. They also don’t die back in the winter. A built-in antifreeze enables them to withstand freezing temperatures and grow and expand in cold weather. Despite their hardiness, Martin cares for the plants much the way someone might a rescued pet. When she sells mosses via an online store she manages, she discourages florists and crafters from making purchases. Anyone who has no intention of keeping her plants alive is no one she wants as a customer. Martin was a moss lover long before she became a moss expert. She spent much of her youth in the forests surrounding her Asheville-area home seeking out interesting lichens and mosses to create unique terrariums for her pet chameleon, Oscar. Later, she started taking pictures of moss. Martin refers to her mosses by their scientific names, and there are so many, it’s hard to keep up with them all. There are hornworts, which have a reproductive mechanism that looks like a horn, and liverworts, which have a round leaf and a leaf pattern that alternates. Others have pointy leaves that spiral around the stem. There is a story behind every tray of greenery in Martin’s care — a rescue from an abandoned homesite, another from beside a busy highway with trucks zooming past. One found deep in the forest, along a pristine streambed, and another found on a steep hillside, lifted from the earth as Martin dug her high-heeled, Coldwater Creek ankle boots into the earth. A collected plant license gives her permission to legally harvest native mosses in North Carolina, and her conscience guides the rest. Mosses are a “social” plant, Martin explains. Several different species of moss can cohabit in a single spot, one right next to the other. They are also transformative in nature. Without sufficient moisture, moss appears dry, but a quick soaking will make it unfurl, tiny green rosettes blossoming and opening as the plant fills with water. And mosses are a mystery to be solved. Because as much as Martin has learned about the plant — both through research and through trial and error — she still makes new discoveries about it. “It can look good after an installation,” she says. “But if it doesn’t last, I want to determine why.” So, she experiments. Irrigation versus hand watering. Planting in soil versus gravel versus clay. Which mosses do well in partial shade? Which ones can tolerate full sun? “Mosses may thrive without any human intervention, but just like any other kind of garden, they’re going to do better if you’re actively involved,” she says. That involvement, and the ongoing discovery that accompanies it, is a crucial part of what keeps her motivated. As Martin and her colleagues explored the shed and surrounding area, they found moss growing in some predictable spots: on rocks next to the creek, atop the soil, and at the base of the trees. Because moss gets its nutrients from the air and the water, it was able to grow on fake grass. Martin knows why moss can grow in the most abysmal conditions, but it was jaw-dropping to discover her plant growing on plastic grass. That awe is what fuels Martin’s dreams of a thriving moss business. It’s what pushes her to go where others have not. Mostly, it is what drives her to moss another day. To learn more about Martin and her business in Brevard, visit her website at mountainmoss.com.